Carers: Caring for a friend or family member who is ill has a substantial impact on the mental health, quality of life and well-being of the carer. My research has provided me the opportunity to meet and work with carers of stroke survivors, including through interviews and attending stroke-related events hosted at HMRI to promote my research. I aim to give carers a platform where their voices and stories can be heard, and to develop support and services that carers have asked for. Click here to read about one study on the unmet needs of carers of stroke survivors that I plan to conduct. Connectivity: I have always had an interest in developing and using technology to connect people together, and address issues such as social isolation. In my research, I am to identify services available to carers, and to connect carers with much needed support, information and importantly to each other. Resilience: In my research, I am to recognise the capabilities of carers to manage the physical, emotional and day-to-day challenges of caring. From my research, I am to develop support and services to help carers increase their quality of life, and achieve happier and healthier lives. Stroke prevention and rehabilitation: I have always had an interest in stroke prevention, particularly in programs which help stroke survivors live healthier lifestyles, and as a result, reduce the chance of a second stroke. I am particularly proud of my Honours work, which was a pilot study of an online secondary prevention program for stroke survivors. I hope that this program will eventually become available to all stroke survivors, and provide them with tools to live healthier lifestyles and increase their wellbeing. Click here to read more about this research. Researching the unmet needs, quality of life and health behaviours of carers has personal significance. My mother has been an informal carer for over 20 years. She has provided care for her mother, aunt and father, whose illnesses included COPD and Dementia along with comorbidities. As a family we have been greatly impacted emotionally, financially and pragmatically on a day-to-day basis. I find it rewarding to provide carers like my mother with a platform for their experiences and voices to be heard. My research dreams are to collaborate internationally with researcher leaders and carers to work on interventions and support services which focus on the health and wellbeing for carers across all caregiving groups. I aim to collaborate with local, national and international research leaders to transform the development and delivery of policy, services, resources to assist informal carers. “The Ultimate Goal” would be to see my research inform resources integrated into routine care around the world, and to make a positive difference in the lives of carers. Miss Alexandra Denham has a background in Psychology. She is a research assistant, and is currently undertaking a PhD at the University of Newcastle. Her primary supervisor is Professor Billie Bonevski, and her co-supervisors are Professor Amanda Baker, Professor Neil Spratt and Dr. Olivia Wynne. 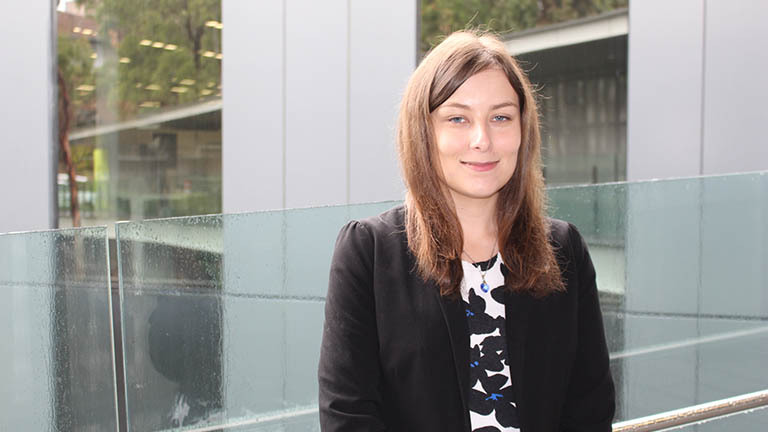 Miss Alexandra Denham is supported by a University of Newcastle Research Training Program (RTP) Scholarship, and her scholarship is also supported by Emlyn and Jennie Thomas through the Hunter Medical Research Institute (HMRI). Her primary research interest is the unmet needs needs, health behaviours and quality of life of carers of stroke survivors. To investigate this, Alexandra is interviewing and surveying carers, and also reviewing ways which carers may use to seek support and information, such as social media, Google and YouTube. My dream is for all carers to have readily available services to support the ongoing and changing needs, quality of life and health behaviours of carers. Through the development of these support services, carers will have the tools and information that they need to live happier and healthier lives, and in turn, increase the wellbeing of the person that they care for.